Marriage may be “til death do you part,” but in certain cases, even that is up for debate. If you think about it, it sounds kind of sweet at first, but the potential to take a creepy turn for the worst is definitely there, too! Just try on this creepy Zombie Husband Costume to see for yourself. A lot of brides would probably be thrilled for their betrothed to lend more of a helping hand in the housework, or to be up for doing more than sitting around and watching TV at home every night. But if an accident brought a fella into an early grave, their widow would generally expect the chances of something like that happening to go away completely (or at least drop significantly). Some guys are just way too committed, though, and being buried six feet underground isn’t going to keep them from getting home in time for dinner! And just because he can’t lift his arms above his shoulders without them breaking off isn’t going to stop him from cleaning out the gutters, like he’s been promising to do for so long, until that pesky “death” thing got in the way. You probably won’t be expected to do any chores in this costume (that we know of), but you may still be expected to behave like a gentleman zombie. 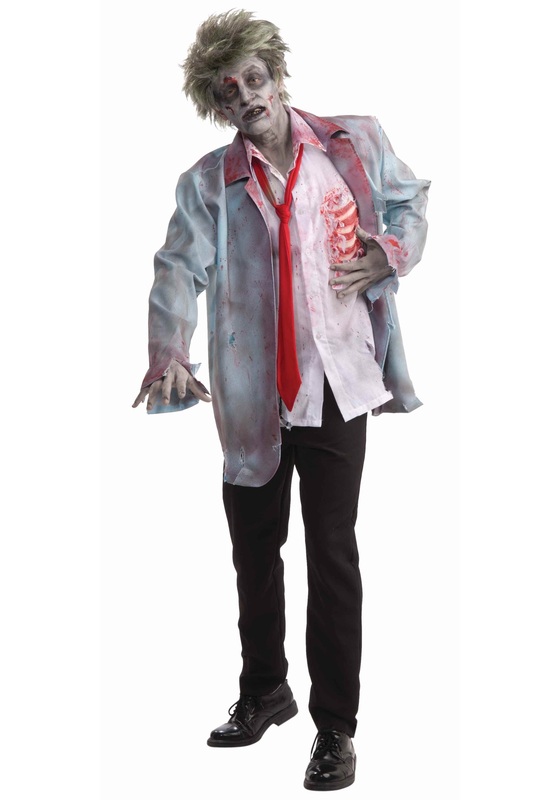 Be sure to add your own trousers to this tattered, blood spattered jacket, button up shirt, and tie, and apply plenty of grisly zombie makeup. To make an adorable undead couples costume, pair up with your sweetheart wearing a Zombie Housewife Costume, and show everyone that true love never dies!